A bit of debunking first, then: We’re not in Perth & Kinross: Perth and Kinross is the local council area for the eastern and northern part of the county. It is an administrative division, not a postal or historic demarcation. Stirling. Likewise, Stirling is the administering council for this part of Perthshire, for Stirlingshire and Clackmannanshire. There is however no county of Stirling and never has been. Stirling, outwith the city itself, is neither a postal address nor a geographical entity. Stirling and Perth & Kinross Councils do do their best to confuse things by putting up signs that appear to be county signs but simply mark where their administrative territory starts, akin to dogs widdling on lamp posts, and about as useful to the rest of us. We’re definitely not in Stirlingshire: that’s a small county some distance to the South of us (blue on the map). So it’s not us either. 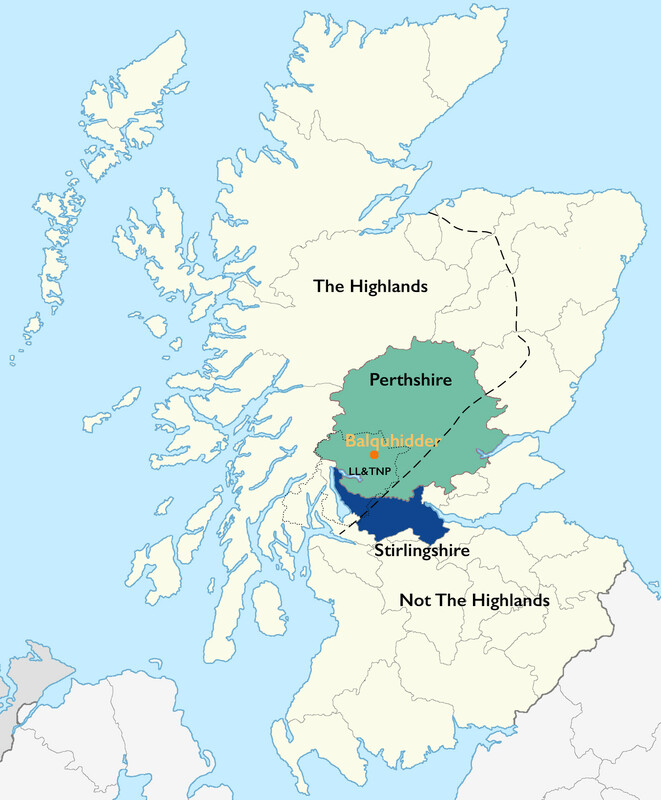 But we are in Perthshire, the “Big County” (green on the map) and the historic and current geography within which we fall. Perthshire is is the registration county (technically, the County of Perth in the land registration system) and used to be used for postal addresses. However, since 2000, counties aren’t officially part of a postal address as it’s now all done with the postcode. Perthshire was listed in Edward I’s 1305 list of Scottish shires (and that’s the last we’ll say about him) and has a considerably longer pedigree than the upstart administrative reshuffles of the last few decades. If you’re sending anything to anyone in Balquhidder, it’s best then to just omit the County – it’s ‘noise’ as far as Royal Mail is concerned – and just address to either “…Balquhidder, FK19 …” or “…Balquhidder, Lochearnhead, FK19 …”. Royal Mail’s database puts us under the Lochearnhead post office area, as our post office was stolen by alien souvenir hunters many years ago. Rob Roy McGregor, no respecter of boundaries of any kind, lived, farmed and irritated people over most of this area. Once he finally stopped leaping around and pretending to be Liam Neeson, he was buried here in Balquhidder. Thanks to Sir Walter Scott though, he is inextricably linked with the Trossachs, which is in fact the area immediately to the south of us, containing Lochs Katrine, Venachar and Achray. Technically, we’re not in the Trossachs. But we are pretty much in the middle of Loch Lomond and The Trossachs National Park. 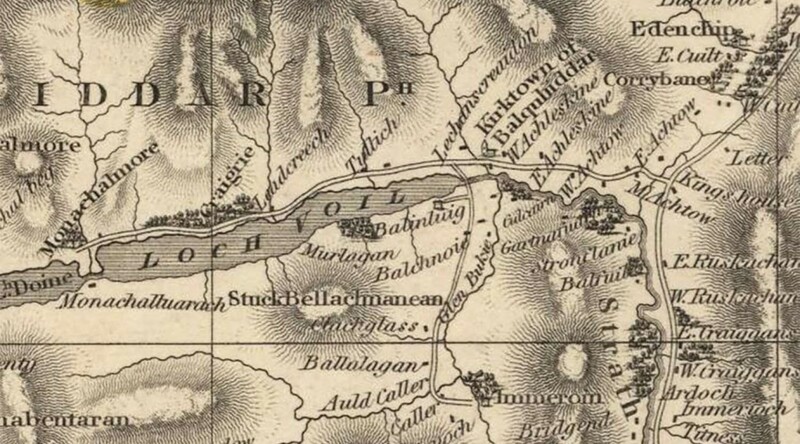 Breadalbane (best not to try to pronounce it – it comes from the gaelic Bràghad Albainn, “the upper part of Alba”) is the historic area to the north of this part of the world, centred mainly on Ben Lawers, Loch Tay and Glen Lyon. But we’re part of it, just: the geographical definition includes the four community council areas of Balquhidder, St Fillans, Killin and Strathfillan. And we’re very definitely in The Highlands, although nowhere near the Highland administrative region – the Highland Boundary fault runs south of us, where the hamlet of Kilmahog gives way to the Pass of Leny: that’s the point at which Scotland turns, in a matter of metres, from rolling farmland to seriously pointy hills, crags and all manner of hairiness. So we’re not Stirling (although Stirling Council administers us), we’re not Stirlingshire, we’re not Perth and Kinross and we’re nearly not in The Trossachs. But we are in Perthshire (which Royal Mail no longer admits to the existence of), we are part of Breadalbane and we are in Loch Lomond and The Trossachs National Park. And we’re definitely Highlanders. Hoots. Loved your blog. It’s a mystery really. I had an argument with a delivery driver who was adamant that the postcode was wrong. He said, you’re in Argyll. Nope. Falkirk. Still proud to write ‘Perthshire’ for my address. Argyll; 0.5mile; Highland; 1 mile; Falkirk? …..